Caladesi Island State Park is a “Best Beach” award winner and there is a Robinson Crusoe adventure of having to get there by ferry from Honeymoon Island. Caladesi Island and Honeymoon Island began life as the north and south ends of one long island until 1925 when Mother Nature sent a hurricane to separate these fraternal twins. Now, there are two gorgeous barrier islands to choose from. Honeymoon is larger and most visitors stop here. They don't know what they are missing! The more adventurous beach bums will take the ferry to the less crowded Caladesi Island. If you brought the yacht, you can go directly to Caladesi Island. If you are like us, we usually leave it at home and take the ferry. Also, if you are into a very long walk, (which we aren't) you can walk from Clearwater on a sandy stretch of land that has only been there since a 1985 hurricane moved some real estate around (as hurricanes are known to do) and attached Clearwater and Caladesi Island. Man Walking Trees because the roots look like they are walking. Mangroves are evergreen trees that live in salt water in coastal areas and support the embankment. Their intertwined roots and stems hang from the branches and look like they are walking. Indians aptly dubbed them, Man-Walking Trees. 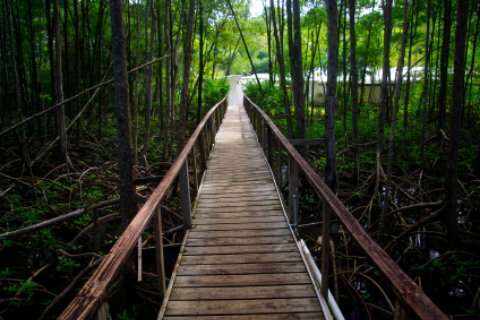 Caladesi Island State Park has a three-mile kayak trail through a tropical swamp under the mangrove trees. Be sure to visit nearby charming town of Dunedin where the friendly people will welcome you like a long lost cousin. Wander around and find lots of places to snack or dine, art from local resident-artisans and souvenir shops. You are welcome in your Caladesi clothes (bathing suit, shorts, etc.). While there are no overnight hotels on this beach, there are some excellent resorts and condos in the area.